Earthday: Earthday Birthday at the EcoCenter! Please join us to celebrate Earthday and the EcoCenter's 9th birthday at Heron's Head Park by volunteering with us on Sunday, April 21, 2019 from 9:00am-2:00pm! Festivities include a park stewardship project, tour of the center, BBQ lunch and cake--all are welcome and tools and food will be provided! However, it is an Earthday celebration so we highly encourage you to bring your own reuseable water bottle. Special kudos if you bring your own cutlery and plate/tupperware. Please note all adult participants must sign our volunteer agreement provided the day of. Minors 14 to 17 years of age must bring this completed waiver with them. All minors under 14 years of age must be accompanied by an adult chaperone in order to participate. The EcoCenter opened on Earth Day of 2010 with Literacy for Environmental Justice (LEJ) as its original owner. With the Port's consent and communtiy support, LEJ designed and funded the creation of the EcoCenter to be used as a teaching resource for folks interested in environmental sustainability. It is now owned and maintained by the Port of San Francisco and operated by the San Francisco Recreation and Park Department. The EcoCenter is an off-the-grid facility with solar panels, a living roof, and a constructed wetland designed to treat wastewater. 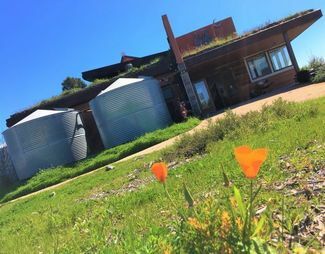 It offers free educational youth programs, habitat restoration volunteer days, drop-in tours of the building, and a community gathering space for the Bayview Hunter's Point Community.The EcoCenter is open Wednesday-Sunday 9:30am-3:30pm. See below for the day's outline and RSVP by Saturday, April 13th to ensure we bring enough supplies for everyone! Help us revitalize the landscape immediately surrounding the EcoCenter facility by weeding, mulching, removing litter and pruning overgrown and dead branches as necessary. Is there an age requirement because I’m 14 and I need to do community service for school. Members of our beaver team help with event logistics: welcoming guests, staging tools, gear, barbeque, tasks to support the success of this event.